In India we used to call the frothy coffee - espresso for some reason.... it looks very similar to cappuccino. I was fascinated by the thick one inch layer of froth on my coffee every time we ordered espresso - sometimes called expresso :). We would try really hard to get the froth at home by whisking a spoonful of milk, coffee and sugar.. if we got even a little bit of froth with 3-5 minutes of whisking, we used to be quite happy! Now most of us in the office are ok with the free coffee we get.. but one of my colleagues really cares about her coffee and insists on having frothy cappuccino every single day! I ran into her one day when she was making something in a cup with an instrument that looked like a tiny hand-held blender. When she said it was cappuccino... 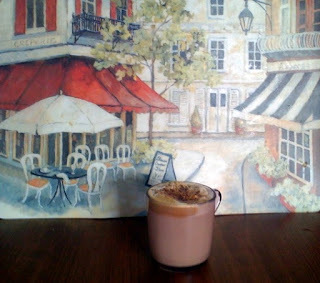 I waited to see the result and was impressed by the quick and easy way of adding yummy froth to a cup of coffee. I thought - what enthu this colleague of mine has to keep a bottle of instant coffee in her office and to take that extra minute to make a nice frothy cappuccino. Of course I peppered her with questions - how do you make this and where did you get that cute little frother etc etc.. Next trip to IKEA I got the frother and tried making cappuccino at home...turned out great! Heat a couple of table spoons of milk in a cup for 15 seconds in a microwave. Add coffee and sugar to this warm milk. Use the frother for about a minute to get a thick layer of froth for your coffee. Heat the remaining milk and water and add to the froth. Sprinkle cocoa powder on top to give a nice touch. It's not a frother, it's a PRODUKT! thanks Shanu - The background is a table mat.. 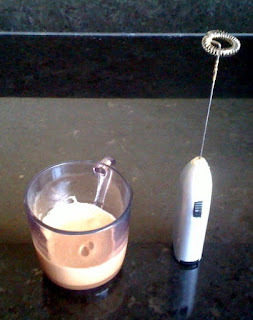 I feel I could have done a better job at it.. but this works too..
frother works great for me :) I use it all the time. @Madhura - yep.. I was so happy with mine that I bought 15 or so and gifted to my cousins and friends in India..